Since the introduction of iLife for Mac OS, iMovie has made video editing easy for all users of modern Apple computers. In mid-2010 Apple made video editing mobile bringing iMovie to iOS, taking advantage of a faster iPhone 4 and updated iOS 4 software. Recent updates brought a more polished UI, new themes (audio, transitions and titles) and the availability of iMovie to the iPad. 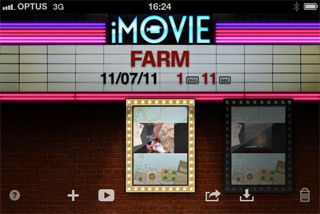 In this post I'll be using iMovie 1.2.1 on my iPhone 4. A recent trip to a friends farm provided some content and an excuse to give iMovie on the iPhone a try. Before you begin make sure all your media you want to use is on the phone. If like me you sync all your photos and video taken with your phone with iPhoto and delete the originals, then sync them back to your phone with iTunes. If you have any photos taken from another camera, sync those to your phone with iTunes as well. iMovie also lets you record voiceovers, video and photos from within the app. Portrait video, can't be zoomed! Something i discovered using iMovie on the iPhone - you cant zoom video! Unlike pictures which can be zoomed and Ken Burns-ified, video can only be rotated (oddly, images cannot). Keep that in mind when shooting for your next iMovie for iOS project, use all landscape or all portrait. Considering output from iMovie is 16:9, shooting in landscape is preferable. iMovie excels at using gestures in an intuitive way; there is no mouse cursor or timecodes here to set in and out points for video! In the editing view, pinch/zoom is primarily for scaling your view of the timeline. Undo is available via the familiar shake of the phone. Dragging clips around to organise your timeline works surprisingly well. One of the more useful gestures is the tap and hold when adding videos. This gesture shows you a better quality preview of your clip allowing you to set in and out points before you insert the clip in the timeline. As the timeline gets crowded (iMovie allows 4 audio tracks along with the video!) this is something I quickly learned to do. One gesture that didn't seem to translate well was the slicing of video, that is to cut a length of video in two. In my project slicing seem to work randomly depending on each clip. A list of gestures can be found in the Projects screen (bottom left, ? icon). Incidentally, renaming your project, albeit not obvious, can be done in the Projects screen as well. iMovie ships with themes to easily style your movie, and I'm sure we'll start to see a slew of YouTube videos that look great thanks to Apple. A theme provides music and titles (read: graphics) that can be applied, and reapplied at any stage to your project, although its not overly obvious how to fully implement themes to your timeline after you have selected one the 8 themes available in the project settings. Double-tap a clip in the timeline, and tap "Title Style" to add either Opening, Middle or Ending graphics to your clip. Once you have finished editing, iMovie for iOS lets you export you clip to numerous sources including iTunes, YouTube, Facebook and Vimeo. But for me, the highlight is playing to a AppleTV (second generation, AKA the black one). Watching your masterpiece is as simple as playing the finished movie in iMovie on your phone and then pressing the AirPlay button in the video controls to send it to an AppleTV connected on the same network. Make sure your iPhone is running iOS 4.3 and your AppleTV is up-to-date for this feature to work. Read more about AirPlay on Apple's site. Here is the final movie! In my next post I will look at editing videos from multiple sources, including AVCHD, using iMovie on an iPad 2. A month before Mac OS 10.7 aka "Lion" was released, my laptop started feeling sluggish. The timing was suspect; I joked that it was a conspiracy by Apple to slow my machine down somehow, thereby forcing me to throw cash at one of those beautiful MacBook Airs. July 20 came and went, and a week later, after checking with Roaring apps that my applications would actually work under Lion (surprising yes!) I took the plunge and upgraded via the Mac App Store. With Lion the machine felt faster, no doubt. But it was an old machine. Cold booting took over a minute to get to the Finder. Java apps were eye-stabbingly slow. It was time for an upgrade. My laptop is a "Late 2008" MacBook Pro, the first of the unibody manufacturing process. Processor is a 2.53 GHz Core 2 Duo, with 4GB RAM and a 320GB Hitachi Travelstar drive at 7200rpm. 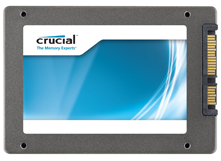 I'm replacing my hard drive with a Crucial M4 256 SSD. It had good reviews on Newegg, and I had read anecdotally that it worked well in my specific model MacBook Pro. It supports TRIM, although Mac OS since 10.6.8 has TRIM suport for Apple-branded SSD's only. The M4 has Garbage Collection for this situation, which apparently does the same thing. The M4 suports SATA III (6GB/s) but is backwards compatible with my MacBook's SATA II (3GB/s) connection for the hard and optical drives. The late 2008 MacBook Pro is advertised as having a RAM ceiling of 4GB, although it can address 6GB with no problems. I bought a single 4GB module of 1066MHz DDR3 SDRAM, to replace one of the 2GB modules. Putting different size RAM modules means no interleaving, but the tradeoff is negligible. This article on Bare Feats has all the juicy details on putting more RAM than advertised spec in this MacBook Pro. I backed up my drive (doesn't everybody?) to my external USB drive, which has 2 partitions, one for Time Machine and another for SuperDuper! to make a bootable image of my drive if things really go bad. Changing the drive was simple, in fact it was easier than replacing the RAM, which was unusual. Stark contrast to replacing a hard drive in a clamshell iBook -- that was a nightmare. These first unibody MacBook Pros come with an removable cover on the bottom of the machine, exposing the battery and hard drive. A phillips and mini-torx screw driver are all that is needed to replace the hard drive -- its amazingly simple. The remander of the case must be removed to insert the new RAM module. This is using a SATA II connection typical of this model. 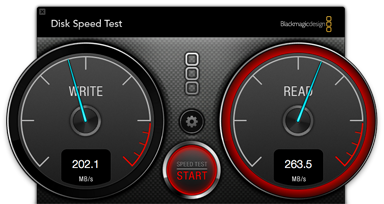 2011 MacBook Pro's have been upgraded to SATA III and I would expect read/write throughput to be even faster -- Crucial claim up to 415 MB/s read speeds. The times for Finder 10.7 refer to a cold boot until I saw the icons on my desktop. I was expecting this to be faster with the SSD especially compared to the differences with other applications. Still, a saving of almost 30 seconds when starting up is great. Shutting down and waking from sleep has also improved greatly I have noticed. No doubt the actual drive is faster, but I believe the SATA connection is also running at a higher (read:maximum) speed. In the system profiler, the Serial ATA information showed the Travelstar connected at a Negotiated Speed Link of 1.5GB/s. This new Crucial M4 is using the full 3GB/s bandwidth which is welcome. Im unsure what real world differences installing more RAM has had, although giving more to RAM hogs like Photoshop will undoubtedly be beneficial. 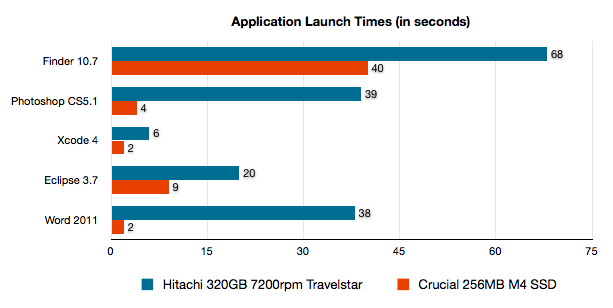 There is a tradeoff with these SSD's of speed versus space, especially being expensive compared to traditional hard drives. I've lost 64GB in space which means ill have to be more diligent in deleting and archiving files I no longer use. Overall I extremely happy with the upgrade and highly recommend it. Smart Converter Free and Pro version 1.2 are now available on the Mac App Store! Free updates for both, so get them now! We had a couple of minor problems with version 1.1 which resulted in some conversions running much, much slower than they had under the original Smart Converter Free. In short, we had inadvertently disabled some of the 'smarts' being applied to conversions in some situations, so Smart Converter got a bit dumb. It was converting as slowly as all the other regular converters out there in some situations. The good news is that Smart Converter is now back to its previous level of intelligence, and even a little bit smarter in some cases (mainly involving AVCHD, or MTS high definition videos) so we're sure that you will love it. As per our previous post about this, Apple won't allow VOB video file support in Smart Converter. VOB files are the videos inside a DVD. We do allow VOB support in our Shedworx version, so if you need this, get the Shedworx version of Smart Converter, not the App Store version. Due to the financial success of Smart Converter Pro, we're able to get started on the next version already. We're planning features for the upgrade now, so please email us with any suggestions you have. We'll post the feature list for v1.3 as soon as we confirm it. As for all App Store apps, this is a free upgrade, so download it now and see for yourself. If you have any problems, please email us at smartconverter@shedworx.com. If you have some general questions that you think others might also want the answer to, feel free to post a comment at the bottom of this post and we'll get back to you ASAP. Good luck with your conversions and thank you to everyone who has purchased Smart Converter Pro so far. 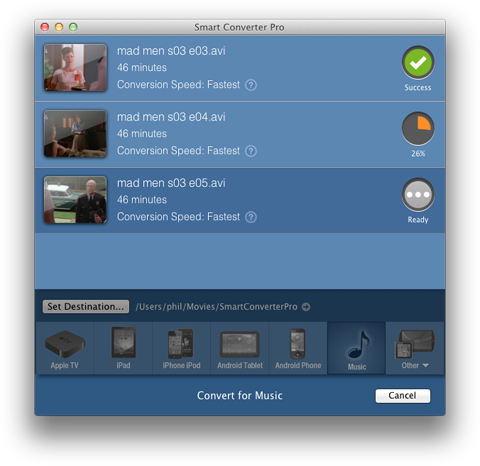 Smart Converter (Free and Pro versions) are now available on the Shedworx Store as well as the Mac App Store. VOB files are the video files on a DVD. The first version of Smart Converter Free contained VOB support so that you could convert a DVD movie file. We did not allow Smart Converter to convert copy-restricted DVDs (i.e. any commercial DVD) so we thought we were within Apple's guidelines. When we submitted Smart Converter Pro, Apple rejected it because it contained VOB support, even though we didn't allow copy-restricted VOB files to be converted. So, we had to remove VOB support from both the Free and Pro versions of Smart Converter that are listed on the Mac App Store. It turns out that a lot of people used VOB conversions! We have no restrictions on our own site, so we've enabled VOB conversions on the Smart Converter that you can download from Shedworx. We have always been committed to fast fixes for serious bugs which people hit. Often, a serious bug can be fixed in minutes and released just as quickly. Smart Converter updates have taken up to two weeks to be released on the Mac App Store. When we make a fix, we like to be able to get it in the hands of the person who needs the fix straight away. Releasing Smart Converter on Shedworx allows us to do this. While we think the Mac App Store is a great idea, we appreciate that not everyone wants to sign up to the Apple machine. For these people, there's always the Shedworx Store. Smart Converter will continue to grow and become more capable. Sometimes the things that we will really want to add won't fit within the Apple guidelines. When we come across features that Apple won't allow, we will still create them, but they will only be available on the Shedworx version. Which Version is Best for Me? Should I buy from the Shedworx Store or the Mac App Store? If you're reading this post, you're the kind of person who likes to find out more about the software they buy. This also means that you're more likely to care about the features we add to Smart Converter that Apple won't allow. Whether its Smart Converter Pro or Free, the Shedworx version will always do more than the App Store version. For this reason we think you will be better off with the Shedworx version. After all, it's the one we use. Within 24 hours of launch, Smart Converter Pro has become the top ranked Video Converter on the Mac App Store worldwide! Smart Converter Pro is now the top ranked video converter in both the Top Paid and Top Grossing lists on the Mac App Store. Smart Converter free edition continues to hold down Number 1 spot on the Top Free list for Video. We've been the Number 1 free Video app for five weeks now. Hundreds of thousands of people all over the world are now using the Smart Converter Engine to convert their video and music. The same Smart Converter Engine is used in both Basic and Pro versions of the app, so everyone can enjoy the unprecedented speed that Smart Converter makes possible. For people who have a lot of files to convert, or just need to take more control of their conversions, Smart Converter Pro is the answer. We're pleased to see so many people buying Smart Converter Pro to take control of their conversions. Smart Converter Pro out now! Smart Converter Pro is now live on the Mac App Store! Output Location - You can now choose where your converted files go. Notifications - we've added a simple audio alert for starters. More coming soon here. Conversion preferences - we've made a start on Advanced conversion settings to give you more control when you need it. This is just the beginning for Smart Converter Pro. Subtitles - A solid and reliable way to include subtitles in converted movies. Notifications - Integration with Growl to let you know what's going on with conversions. Scripting - An AppleScript API to let you hook up Smart Converter to your workflows. And Much More - We will continue to check on the App Store reviews and listen to what you tell us would help you. We're Smart Converter users too, so we'll keep looking for ways to make Smart Converter the best media converter out there.